In the past few years, mankind has witnessed a massive, technology-driven shift in the way we communicate and connect. While the amount of technology we interact with on a daily basis is increasing exponentially, the core meaning of what it means to be human remains the same — to seek and discover what it means to be truly happy. Being human in the digital age means to seek out and discover experiences that propel us forward toward our goal of personal happiness and to use technology to our benefit and enhance the experience along the way. As Soren Kierkegaard once wrote, "Life can only be understood backward; but it must be lived forwards." Living life forward means embracing the benefits of technology and incorporating these advantages to experience a more meaningful, more connected, and happier life, a concept that millennial women excel at. Recent research in the field of neuroscience shows that women are born behind schedule in their search for happiness, as 50% of their happiness is predetermined at birth. The remaining 50% is up to her, determined by the choices she makes during her life. Additionally, reports in mainstream media would have you believe that the road to happiness is rough, hindered by a culture of always-on smartphones and other technological inventions, such as social media, that fuel an unhealthy and unhappy society and are creating a generation of unhappy women. Our research paints a very different picture and proves that the digital age is not so dire but rather brimming with opportunities for women to use technology to be more successful, more connected, and happier. POPSUGAR explored this concept in depth in a research study where we sought to uncover the role that technology, content, and connected devices play in helping women find happiness. We learned that overall women are happy. Nearly seven in 10 women say that they are generally happy and believe that they live a good life. 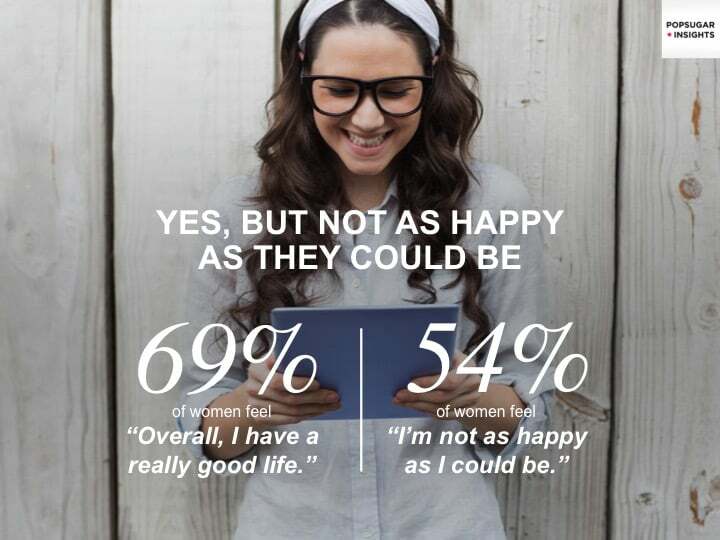 However, our research uncovered that 54% of women say that they could be happier. They know that happier times and a happier version of themselves are possible, and they acknowledge that they need help to discover how to accomplish that goal. We found that 70% of women are currently deriving happiness from their ability to use technology to improve their lives. And three in four women believe that technology can actually make them happier. Two dominant themes for happiness that emerged from our study were having strong connections and finding moments of personal bliss. We learned that happiness improves with age and life stage and that the establishment of social connections, both in real life and digitally, and carving out time to connect and communicate with loved ones fuel a woman's happiness. Additionally, we learned that taking "me time" is important in order to allow women to pause and focus their energy on their goals. As recent research shows that millennial women spent nearly 18 hours per day consuming media, much of this "me time" is spent focused on a digital screen. More often than not, taking "me time" means spending time with snackable digital content, seeking out content that entertains, informs, or inspires them around their passion points from shopping to fashion, from food to fitness, from beauty to entertainment topics. As women spend more "me time" with digital content, there is an opportunity for brands to help women find their happy by providing them with high-quality visual content that is worthy of their time and attention. Our research shows that women want content that helps make smarter choices, set achievable goals, and inspire them to increase their happiness. Brands that invest in providing women with thoughtful, high-quality native content reap significant rewards. For example, 68% of women said that they are more likely to purchase products from brands that use high-quality visual content. So, how can marketers help women find their happy? At the end of the day, like in any relationship, it's all about making a deep and meaningful emotional connection. When it comes to digital experiences, women form three types of emotional connections with the content they consume and the brands that provide that experience. They seek to be entertained, informed, or inspired. From our research, we've developed the "3 P's of Happiness" to help brands better understand how to create a deeper connection with women. First, you need to power her happy. Remember that happiness for her equals carving out moments of bliss every day and that digital content is her new me time, so find an opportunity to make her laugh by sharing more of the funny content that she wants to see (and share) online. Second, be a problem solver for her and help to remove her roadblocks. Women want brands to help them make smarter choices and set achievable goals, so create content that allows her to remove the boundaries that prevent her from becoming happier. Finally, be a positive association in her life. Women seek inspiration from brands, so brands have an opportunity to be a champion, a shoulder to lean on, or a motivator to inspire women to find their happy. Women seek out content that is authentic, snackable, and positive, so help her by being a positive force for happiness in her life. The road to happiness is a long one, and women have choices when it comes to digital content, so in order to stand out from the crowd, brands need to create content worthy of a woman's time and attention. To accomplish this, brands need to use high-quality visuals to tell interesting stories and share unique experiences to power their happy, to make her life easier by being a problem solver, and to always be a positive association in her life. By focusing on these core principles, brands will make a lasting impression and help women feel happier and more connected in this digital age.